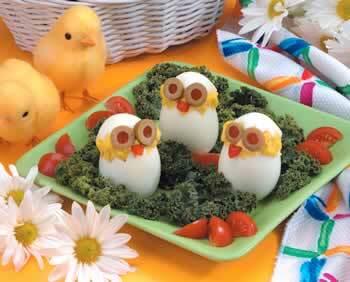 These big-eyed chicks will steal the show at your Easter table or on a buffet! The Taste of Home Test Kitchen staff took a little artistic license with a recipe shared by field editor Tami E. of Dumont, Minnesota…and came up with these clever chicks. Cut a thin slice from the bottom of each egg so it sits flat. Cut a zigzag pattern a third down from the top of each egg. Carefully remove yolks and place in a small bowl; mash with a fork. Add the mayonnaise, Parmesan cheese, onion, curry, mustard and pepper; stir until well blended. Spoon yolk mixture into the egg white bottoms; replace tops. Cut olives into slices for eyes. Cut 12 small triangles from red pepper for beaks. Gently press the eyes and beaks into egg yolk filling. Refrigerate until serving.